Nursing Home Abuse of Younger Residents With Disabilities | Hupy and Abraham, S.C.
We often think of nursing homes as places for senior citizens. While the majority of nursing home residents are older, there are some nursing home residents who have not yet reached their 65th birthdays. According to the Henry J Kaiser Family Foundation, there were approximately 2,300 people aged 0 to 64 living in Iowa nursing homes and 218,000 people aged 0 to 64 living in nursing homes throughout the United States in 2014 (the most current year for which data is available). Medicaid nursing facilities, for example, are open to anyone age 21 or older. Nursing facilities for people under age 21 is an optional and separate program in which Iowa and all other states currently participate. Unlike other types of home and community services, nursing facilities may not limit access to services. Anyone who qualifies for nursing home services should have access to such nursing facilities. However, states must evaluate people with significant mental illnesses or intellectual disabilities to determine if nursing facility care is truly needed and appropriate. Sexual abuse. It is only recently that sexual abuse in nursing homes began receiving media attention. Nursing home staff, fellow residents, and visitors may take advantage of a nursing home resident’s physical or cognitive weaknesses and commit sexual acts that cannot be consented to by the nursing home resident. Neglect. Nursing home staff members need to provide reasonable care to nursing home residents of every age. This includes help getting out of bed, assistance with toileting and bathing, assistance with eating, providing medication, and other help as needed for the individual resident. Intentional abuse. Nursing home staff members may become frustrated with residents and use physical restraints or physical force to control their behaviors. This can be terrifying if you are trusting your loved one’s care to a nursing home. It is important to promptly report any of these signs of abuse to your loved one’s doctor so that a prompt diagnosis can be made of any nursing home injuries. In some cases, nursing home abuse or neglect can result in death. If your loved one has suffered any of these injuries—or any other injuries—because of nursing home neglect or abuse, then we encourage you to contact an experienced nursing home injury lawyer as soon as possible. Regardless of your loved one’s age, she deserved to be safe in her nursing home. 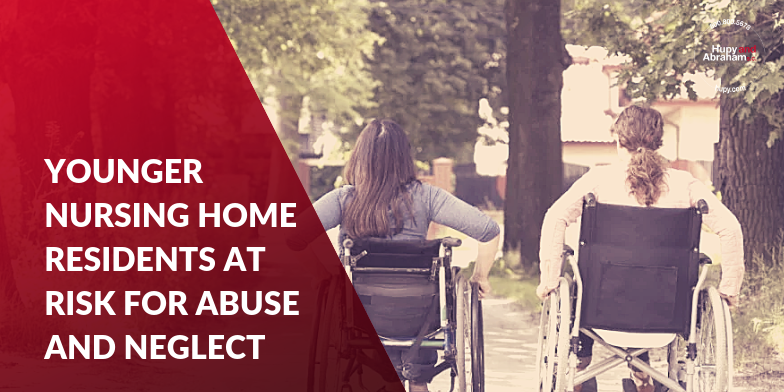 Our lawyers will represent nursing home abuse victims of any age if they have been abused or neglected. We will investigate the cause of your loved one’s injuries and we will fight to protect her legal rights. To learn more about what you can do to help your loved one, please read our free Guide for Nursing Home Abuse and Neglect Victims: What You Need to Know to Protect Your Legal Rights and Get Every Dollar You Deserve and call, text, or email us today to set up a free, no-obligation consultation with one of our experienced lawyers.